Let me begin by giving a little background. 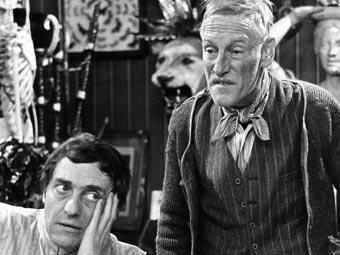 Uncle Eric had more than a passing resemblance to the elder Steptoe, of Steptoe and son. For you folks residing in the yewess and other exotic parts of the world this translates as follows. Approximately 5’4″ tall, 140 pounds, 50 million years old, 49 million of which were spent in a fish smoker. Face all wrinkled and rather than an impish grin, an evil leer. Exactly the sort of person that you have told your young children to avoid. Uncle Eric was the owner of the “Horse and Harrow” a fine drinking establishment in darkest Oxfordshire. 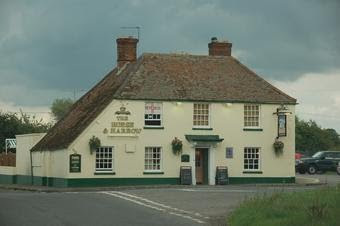 The pub being located on the main road between Didcot and Wallingford assured a steady supply of unsuspecting victims. After a close encounter of the Uncle Eric kind few would venture back. The local’s on the other hand flocked to watch the antics. For the most part the regulars were spared special treatment. One fine Saturday lunchtime Uncle Eric is tending bar and holding court on the subject of ‘them bloody commies’ , ‘or ‘hem bloody tories’ , or whichever group was currently annoying him. This could be homosexuals, the local Didicoy population, (yes I know, whats a didicoy?, its an old Berkshire slang term for a gypsy) who he was formally convinced were stealing his livestock, or some other minority that had caught his fancy. merkins). Uncle Eric has taken an instant dislike to this guy. The tension begins to mount, the locals can smell blood. It has taken no more than a minute for this interloper to annoy Uncle Eric.The guy takes a couple of slugs from the glass, puts the glass down,slowly scans the bar, stands up and then declares, “I’m going to the toilet, no one drink my beer because I’ve spat in it”. And off he goes to relieve himself. He comes back after a couple of minutes, sits back down and resumes scowling at the audience. Long minutes pass,he picks up his glass and takes a long pull of finest Morlands bitter. Puts the glass down, and declares to Uncle Eric that the beer has a sweet after taste to it. The fun begins. Uncle Eric explains patiently that while the guy was out taking a leak everyone in the bar had also spat in his beer. The scowl changed to worry, to a look of shock and horror. The victim races to the door, barely making it out into the parking lot before throwing up. That needless to say was the last time that victim was seen in the “Horse and Harrow”. Ahh, how I miss him, a star indeed. No user commented in " Uncle Eric And The Sweet Beer "